Discover Castel camping le Brevedent ! The different areas of the campsite. Pitches on the edge of the pond which enjoy a very pleasant view. These places are ideal for small or medium caravans, tents and camper but are not necessarily suitable for large caravans, because of the maneuvers to do to settle there. Pitches near the pool, and overlooking the lake. 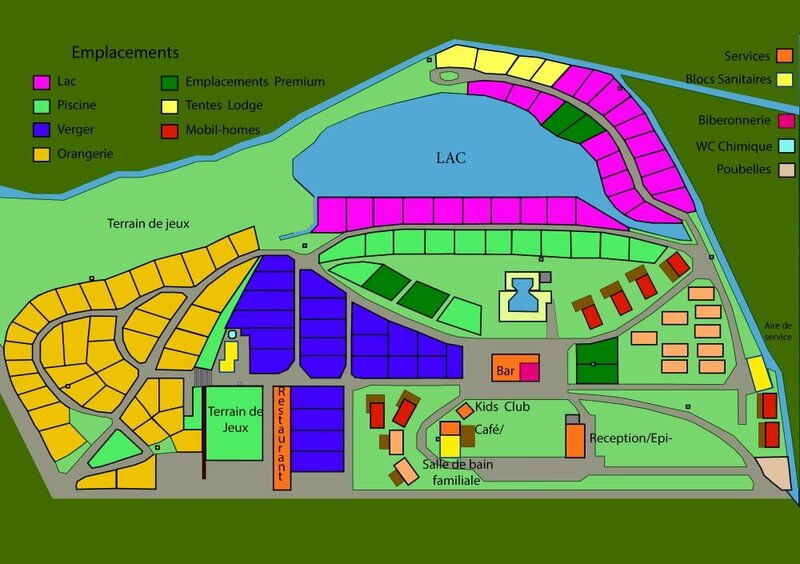 This area is more suitable for tents, small and medium caravans, motorhomes and combis. This area is the most central of the campsite, between the mansion and the restaurant. Close to playgrounds and toilets. Under the apple trees, these sites are spacious, and some are very suitable for short stays because they are easy to access. This area is suitable for large caravans, small and medium, as well as large tents, or large motorhomes. This is the lower part of the campsite where you will find “the big tree”, a majestic tree that serves as a playground for the children of the campsite. It is also where we have our vegetable garden in permaculture. Here the places are large and level. Ideal for all hosting formats. One of the toilet blocks has large family cubicles, with baby bathtub, shower and sink. Then there’s a more traditional toilet block, with separate areas for men and women, as well as a dedicated area for children. Finally, the most recent toilet block is one of the most beautiful in France. Having a shower is a moment of bliss with the natural light that filters down into each of the modern and heated shower cubicles.